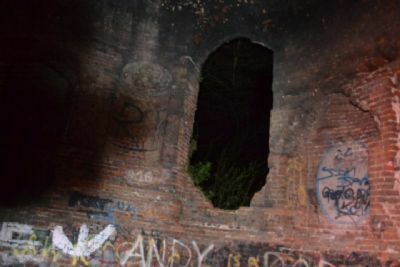 Below is my written Report from my investigation at Racton Ruins. 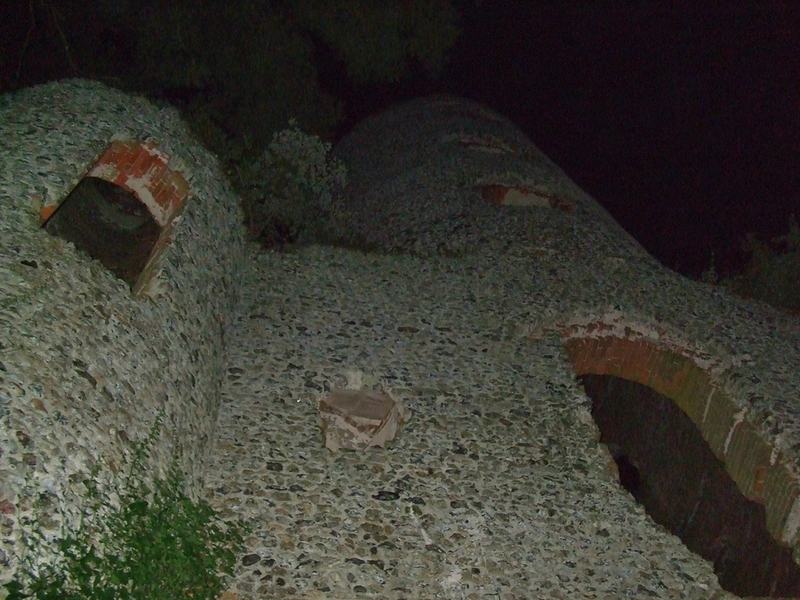 This investigation of Racton Ruins (history seen below) was brought on by a friend ‘Maria’ who I have been speaking to about my research, She is sceptical of all aspects of the paranormal & she has been explaining how she would really like to have an experience (like us all), I had previously investigated Racton and had my first & last (to this date) spontaneous investigation so it seemed like the perfect place for a possible paranormal experience. The 2nd Earl of Halifax commissioned ‘Racton Monument’ (now known as Racton Ruins), Its actual use throughout history is somewhat unknown even by the current owners of Stansted House, There is many theories surrounding its original existence. Possibly a summer house for Stansted House – this cannot be confirmed. Earl had the Monument built so he was able to watch the merchant ships at the local shipping dock at Emsworth – this cannot be confirmed. In recent years the history has a much darker avenue….. It is claimed to be used by smugglers, Occult Acts are reported to take place at the location – Satanic groups have been drawn to the location due to the design of the monument (a triangle base) which has some similar characteristics to some symbolism used in ‘Spiritual Satanism’. There has been suicides at the location a few times, the more recent and well documented suicide was of a local taxi drive who hung himself there after a dark spell of depression and money difficulties. I Conducted my previous investigation at Racton Ruins on my birthday last year (November 16th 2015) And like I said above it was my first experience of a spontaneous paranormal investigation and I have never experienced anything like it since. There was some very aggressive EVPs, motion sensors were being activated, some unusual shadows appeared on video and my girlfriend saw a partial apparition, By the end of the investigation all 4 people present felt like we were being dragged into the middle of the circular floor and had to hold on to the walls to walk around and get out. That night there seemed to be something negative about that location, it was the first time any of us (me and my girlfriend) were ever affected from an investigation. There is a sighting on Paranormal Database of someone who witnessed 2 full apparitions of children (about 11 years old) by the tree-line of the monument (dressed in 1950s clothing) 1 of them sat in a swing, whilst the other child is pushing the one on the swing, they suddenly started floating away before disappearing. - I contacted Darren from Paranormal Database about contact information for the witness but the email address used for the entry was no longer active. There is many other sightings which are all mimicked on various paranormal websites with all the same information but again no actual witness information is able to be obtained…. A “Tractor” phantom is claimed to be in the fields by the tree-line that comes right upon you and then instantly disappears. Outside of the tower (circling the tower) there is a woman ghost who is dressed all in white, she has not been witnessed (by accounts online) inside the tower but is seen regularly walking around it. A Ghostly face (maybe the woman who walks around the tower) looking through the windows of the monument (this is very similar to my girlfriends experience – but this was not known to us until this investigation). There has been bricks/Rocks/Stones thrown from the top of the tower at people in the centre of the tower, There has also been a witness Ady who had the experience and a shadow person sighting : He was at the tower entrance stood in the lower floor, there was all bricks on the floor so they moved them all to the furthest to the entrance they could put the rocks so there was nothing on the floor they were all positioned behind them. Ady and his girlfriend felt something hard hit their leg his right leg and her left leg and they even found a brick in front of them which wasn’t there moments before. As he was trying to calm his girlfriend down he saw out of the corner of his eye a shadow of something move very quick and when we went to look for it there was nothing there, it was a black shadow with a white glowing outline , he has not returned since this event. There was 3 photographs published online from ‘Southern Ghost Society’ what they consider to be something paranormal captured visually (seen below), There is 2 photographs with “Black Mist” and a “Blue Apparition”. It wasnt due to rain until early the next morning so we took our chances and went to investigate hoping that the weather remains dry until we would be leaving Racton, We made every attempt to arrive with some day light left & planned to arrive at the ruin for 7.30PM unfortunately we left some equipment at Maria’s house, so once we returned to get the bag and heading back to Racton it was 7.45PM and dark on our long walk up to the ruin. When we first arrived at the ruin, we decided to take some photographs of the outside of the ruin and went around the ruin taking photographs, and it was starting to rain at this point – this wasn’t necessary a bad thing through, because I had the perfect examples of showing Maria how easy it is to take a photograph of an ORB (Rain + Digital Camera + Flash = ORB) Who agreed and had a similar view of all the Orb photographs in existence from paranormal teams. As we were getting a little wet we went into the ruin and done some observational work and whilst we were in there, we both thought we heard a breathe (exhale) but there was a lot of audio contamination that could make our brains think is a breath or a voice, but in-fact wind, water and an object. Firstly we were familiarizing ourselves with the location and moving any obvious trip hazardous objects from the investigation area, We then had an inspection of the inside of the tower looking for any symbolism that might be engraved or spray-painted but we did not find any evidence of anything of an occult nature (Not to say it has not happened, just there is no remaining evidence of it taking place). The rain at this stage was really going for it, and there was a lot outside noise from the farm down the road from the ruin never the less once the farmers locked up the gate I set-up a night vision camera (on a tripod and IR Illuminator) recording the area we were positioned (by the front entrance) I had a HQ Digital Recorder in waterproof container (positioned on a tripod) with a ULF microphone to the section to the left of the entrance (room on the far left). Never the less we conducted our investigation and investigated (through EVP & Observations) The claim of children, The bricks being thrown, The Occult Acts, The Woman outside the tower – nothing paranormal was experienced during this time although during the times of silence there was an EVP that came through very clear, which made the whole investigation worthwhile knowing what we were fighting and still managed to obtain a very negative EVP in the middle of it all. I Instantly started to pack away the equipment as they came in and started talking to us about the ruin and “Ghost Hunting”, just for the record they came with no equipment to “Catch” the ghost, they were smoking and they have been doing it for years as a team. Their accounts were made up fairy-tales and they obviously have never been part of a serious investigation or even know that one exists. At one point (although we did not witness it) we think that 1 of the 2 men chucked a stone, pretending it was something, I had a feeling in my stomach that it was not anything - that 1 thing that happened the whole time, I just didn’t buy it. 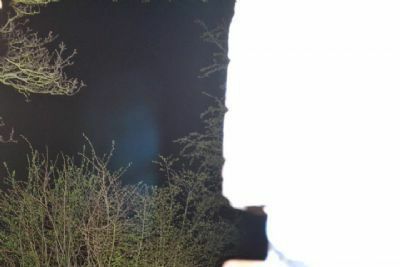 We were very happy when they left, we were able to “Debunk” some “Visual Evidence” published online from ‘Southern Ghost Society’, They uploaded to their website 3 photographs of unusual anomaly’s captured at Racton ruins during one of their Hunts. “Black Mist” that appeared in 2 of the photographs. “Blue Anomaly” appeared in 1 of the photographs. The Blue anomaly is a very simple photography error caused by Lighting (glare), slight movement of the camera during the shot, shutter speed – The lens reflects light into the viewfinder that transpires the lighting into the photograph, they can appear in multiple different colours….The most common colour for this false anomaly to appear is blue through a digital camera and red through a mobile phone, Also blue anomaly's on camera are often caused by water. Often in low lighted situations (such as Ghost Hunts) cameras produce strange anomaly’s, this is due to the cameras are trying to understand the blacked out area and often they make it up and use the lighting what is available and fill in the blanks. Although we were not able to replicate the exact photograph we were able to catch examples to my theory of the anomaly, ive had very similar photographs sent to me for review and after reviewing exif data it was correctly debunked. For this photograph I did not the Exif Data available but I am able to understand the process behind its appearance. Black Mist we were also able to find a similar replication of the photographs taken from SGC , I think that there was something slightly of the camera lens whilst the 2 photographs were taken, we do not know what that object could be, so we had to insinuate and tried a number of things and I believe that there is enough replicated in our attempts to also remove the Black Mist from being anything visually paranormal wise. The rain was bad and so was the thunder so we called it a day and headed home, although there was a lot of reasons not to investigate that evening im very happy we did. We managed to catch an EVP. Tested Theories about Electrical Storms. Adding more unknown about Racton Ruins and the Paranormal. 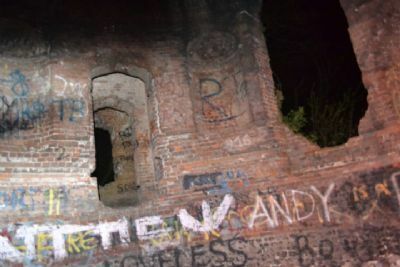 Below is Maria’s Report from our investigation of Racton Ruins. This was my first ever investigation, And what a place to start with, the well know Racton ruins,Know for its high level of activity. I thought I may of been alot more anxious about it. But I was rather excited about it all. Going with a list, to see if we could prove or dis-prove some of things that had been seen,heard or witnessed there. The Night didnt start of all that well, when we got there and I had left a bag back home. So off home we went, grabbed the bag drove back. We then started the long, long walk up to the ruin. When we got there I really wasnt too sure how I would feel, after reading how people find it Cold,Scarey and Eerie. But I found the ruin quiet beautiful And peaceful. We took a short walk round the side of the building and took some photos, as it was almost dark and had started raining. So we jumped inside and just took in the surrounding, whilst waiting for the rain to stop. Whilst waiting the amount of sounds we heard was unreal, BUT, Most of it was due to the rain or the area around the building. Apart from one sound that we both heard, To me was a short hard exhale of breath. But once again due to the weather and not having the equipment set up, couldnt be documented as anything paranormal. The rain didnt seem to want to stop. And at this point We could hear a few voices for a while, but this was just someone local who had been up to shut a gate that was close by. They did eventully go, so andy set up the video recorder and the digital recorder and did a few EMF readings, which were completely flat. Only then did we (andy mainly) start to ask questions. He asked about if there were any demons in the area, as there have been reports that occult activity there. And at the time we didnt get anything back, Nor did we get any activity when we asked about rocks/bricks/stones being thrown at people. I had earlier put a red rock on the ledge on the other side of the ruin abit earlier. This rock didnt move in any which way. So far we had no evidence at all to show for the night. And I really didnt expect any as the place was just so peaceful. We then asked a few questions about the lady that had been seen walking in the area, yet every now and then going back asking about demons being there. And we still had nothing happen or hear anything. Oh apart from a very irritating cricket we couldn`t find, an owl and andy hearing a few squeaks. But what topped the night of was two guys who turned up, wanting to "HUNT" ghosts. At that point, Andy put all the equipment away and we just sat listening to thier "STORYS" Of them ghost hunting and where they had been. Basiclly our night was over!!!! Apart from the spectacular thunderstorm we were witnessing whilst being there. After a while we decided to make a move, as we both knew we werent going to get anything tonight. And whilst we both had our backs turned a stone/rock was thrown accross the room. I For one suspected it as being one the guys there, As we had asked about it for a while and nothing had happened. And neither me nor Andy felt it was anything paranormal. They both left and not long after we also left. Making the LONG DARK (and actully more scarey than the building) walk back to the car. All in all i loved the night even if i didnt witness anything . And im rather excited to go and try again another night. And hopefully no-one will come along and ruin it. I will surely revisit this place for more detalis.Thanks for the mention. Good luck with your future investigations. Now be sure to check http://www.bestessayuk.com this page. See ya!